Minus K Technology, Inc. Inglewood, Calif.
Laser and optical systems, whether used in academic labs or industry, very susceptible to vibrations from the environment so these instruments frequently need vibration isolation. They measure a very few angstroms or nanometers of displacement and need an absolutely stable surface upon which to rest. Any vibration, coupled into the mechanical structure of the instrument, causes vertical noise and a fundamental inability to measure these kinds of high-resolution features. As industry continues to broaden laser and optical research and applications, necessitating more sensitive equipment and expanded lab facilities, vibration-handicapped environments will become more prevalent, and better vibration isolation than what has been available will be required. Negative-stiffness-mechanism or NSM vibration isolation enables laser and optic instruments such as scanning probe microscopes or SPMs, micro-hardness testers, and optical profilers to operate under severe vibration that would otherwise be impractical with passive and electronic isolation systems. Traditionally, large air tables are the isolators used for laser and optical equipment. The ubiquitous passive-system tables, adequate up until a few years ago, are now being seriously challenged by the need for more refined imaging requirements. Benchtop air systems do provide limited isolation vertically and very little isolation horizontally. However, SPMs, for example, have unforgiving vibration isolation requirements that are unparalleled in the laser and optical world. The vertical axis is the most sensitive for most SPMs. These systems can also be quite sensitive to vibrations in horizontal axes. For the lowest possible noise floor, on the order of an Angstrom, vibration isolation must be used. NSM isolators have the flexibility of custom tailoring resonant frequencies vertically and horizontally, providing increased isolation performance over air tables. A vertical stiffness adjustment screw can regulate compression force on negative-stiffness flexures. The screw raises or lowers the base of the support spring in response to varying weight loads to keep flexures in their straight, unbent operating position. Flexures are used in the isolators to avoid stiction and friction. Similarly, laser-based interferometers also are sensitive devices that must resolve nanometer-sized motion and features. They often have very long mechanical paths that make them even more sensitive to vibrations. The sophisticated modern ellipsometry techniques that allow this high performance rely on low noise to detect fringe movement. Properly isolating an interferometer allows it to provide the highest possible resolution. Interferometers and other optical systems such as optical profilers are often quite complex, and have long optical paths that can lead to angular magnification of vibrations. Air tables can make the problems worse because they have a resonant frequency that often matches that of floor vibrations - typically 2 to 3 Hz. In addition, their isolation efficiency is quite limited below about 8 Hz. NSM isolators provide isolation in these environments when air tables cannot. Negative-stiffness-mechanism vibration isolation systems have proliferated for laser and optical applications. Not only is it a workable vibration solution, but it costs significantly less - to one-third the price of active and traditional passive systems - making it an economical component for cost-conscious designers. This isolation is used internationally, in applications including nanotechnology, biological sciences, semiconductors, materials research, zero-g simulation of spacecraft, and audio for private companies, universities, and government laboratories. Negative-stiffness isolators provide transmissibility, vibrations through the isolator relative to input vibrations. Transmissibility with negative-stiffness is substantially improved over air systems, and even over active isolation systems. Also known as electronic force cancellation, active isolation uses electronics to sense motion, and then adds forces electronically to effectively cancel out or prevent it. The efficiency of active isolation systems is adequate for applications with the latest lasers and optics as they can start isolating as low as 0.7 Hz. However, because they ran on electricity, they can be negatively influenced by problems of electronic dysfunction and power modulation, which can interrupt scanning. Active systems also have limited dynamic range that is easy to exceed, causing the isolator to go into positive feedback and generate noise underneath the equipment. Although active systems have fundamentally no resonance, their transmissibility does not roll off as fast as NSM isolators. A horizontal-motion isolation system is represented by two beam-column isolators. Horizontal stiffness can be made to approach zero by loading the beam columns to advance toward critical buckling load. Negative-stiffness isolators employ a completely mechanical mechanism for low-frequency vibration isolation. 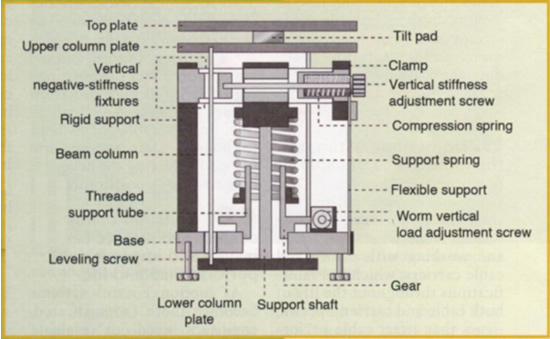 Vertical-motion isolation is provided by a stiff spring that supports a weight load, combined with an NSM. The net vertical stiffness is lowered without affecting the static load-supporting capability of the spring. Beam columns connected in series with the vertical-motion isolator provide horizontal-motion isolation. The horizontal stiffness of the beam-columns is reduced by the "beam-column" effect. (A beam-column behaves as a spring combined with an NSM.) The result is a compact passive isolator capable of very low vertical and horizontal natural frequencies and high internal structural frequencies. The isolators (adjusted to 1/2 Hz) achieve 93% isolation efficiency at 2 Hz; 99% at 5 Hz; and 99.7% at 10 Hz. Negative-stiffness mechanism isolators typically use three isolators stacked in series: a tilt-motion on top of a horizontal-motion on top of a vertical-motion isolator. Kn = Magnitude of a negative stiffness, a function of the length of the bars and the load P. The isolator stiffness can be made to approach zero while the spring supports the weight W.
Each isolator behaves like two fixed-free beam-columns loaded axially by a weight load W. Without the weight load, the beam-columns have horizontal stiffness Ks. With the weight load, lateral bending stiffness is reduced by the beam-column effect. This behavior is equivalent to a horizontal spring combined with an NSM so that the horizontal stiffness is K = Ks - Kn where Kn is the magnitude of the beam-column effect. Horizontal stiffness can be made to approach zero by loading the beam columns to approach their critical buckling load. Minus K Technology Inc. develops and manufactures vibration isolation products based on its patented negative-stiffness-mechanism technology. For more information, contact Steve Varma at (310) 348-9656 or sales@minmk.com, or visit www.mimisk.com. Dr. David L. Platus is the inventor of negative-stiffness mechanism vibration isolation systems, founder of Minus K, and holds over 20 patents related to shock and vibration isolation. He earned a B.S. and a Ph.D. in Engineering from UCLA, and a diploma from the Oak Ridge School of (Nuclear) Reactor Technology. Previously, Platus worked in nuclear, aerospace, and defense industries conducting and directing analysis and design projects in structural-mechanical systems. He became an independent consultant in 1988.